Here’s another rendering of this principle, one you may remember from the movies. Mrs. Rabbit: What did your father tell you this morning? 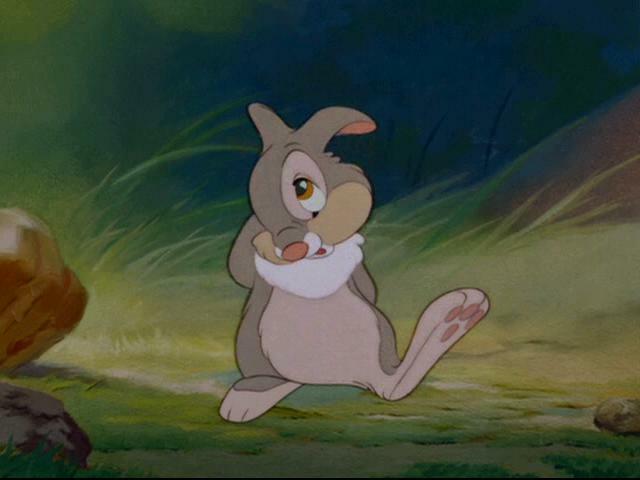 Thumper: [clears throat] If you can’t say something nice… don’t say nothing at all. Any principle so broadly accepted that it is espoused by Islamic mystics, evangelical Christian ministers and Walt Disney must have something to it. This is part of a letter addressed to the members of a very young church, intended to help them live together in their new relationship as a community of God’s people. Changed by their devotion to Jesus Christ, they struggled, as did all the early churches, to live out their new commitment in the ways they interacted with each other and with the community around them. If we’re looking for guidance, we find the same advice across time and faiths and even in popular culture, don’t we? Lucy is up at Pilgrim Lodge this week, having a second turn this summer serving as a CIT, a sort of Junior Counselor. As we turned down the dirt road at the entrance, she breathed a happy sigh and said, “This is the best.camp.ever.” She says that now knowing what goes into making it such a special place. And she would tell you that it came as a slightly disappointing surprise to take the CIT training last year and learn that so much of what she thought just HAPPENS at Pilgrim Lodge is in fact intentional. The rules, the boundaries, sure, she knew those must be thought through and planned for good reason. The schedule, the option times and special activities—yes, those require planning. But what surprised Lucy is that the counselors, junior and otherwise, learn how to create the atmosphere of trust and acceptance and gentle discipline that IS Pilgrim Lodge. The labyrinth at PL–read more here. It’s true that the spirit of the trees and the lake make it easier. Campers—and counselors, too—are unplugged from the world and have a chance to be more present. They swim and sing and walk the labyrinth and pray in the chapel and wake up the echo and listen for the loons. But the intentional work of the staff and the volunteers maintains what they call being “Pilgrim Lodge-ical.” And that means treating each other the way the epistle teaches, with kindness and an understanding that we are all part of the body of Christ. 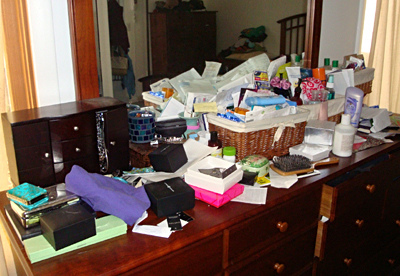 And while it might be true that the top of someone’s dresser is a mess, the way I named it was not helpful, or inspirational, or necessary, and it wasn’t even close to kind. Before you speak – maybe you do better at this kind of thing than I do. Maybe in a moment of frustration you can walk through those three gates and hold yourself back. Oh, there are times I get it right, but I absolutely get it wrong, too. We didn’t stay mad long enough – yes, we were both mad, but mostly me—to have to worry about the sun going down on our anger. But I’ve been known to hold onto things. You? If you haven’t, God bless you. Speaking the truth while being kind, being angry but not sinning—these are not easy things to do. They never have been, and I’m afraid living in the modern world in which we have so many more ways to fly off the handle at each other makes it even more difficult. There are too many ways to respond instantly. Just read the comments on almost any newspaper website. Actually, don’t. They might make you despair about humanity. Christians are just as apt to live by the 21st century rules as anybody else. We carry out our arguments about God and what we think the Bible means and who we think Jesus was and who he would have approved and disapproved in every kind of public forum we can find. We leave nasty comments and accuse each other of not being Christian at all. In America, we mix up our national identity with our faith identity and that just makes us meaner to each other. We let the sun go down on our anger as regularly as the sun goes down. That’s the big “we,” the overarching “we,” and you and I can’t do much to change the way the big “we” does things. We might wish the world were more like how we do things at our house (well, except for yesterday morning at mine). But we can only change the way we, little “we,” this us right here and the you and me who form it. We can only change ourselves. Now, we know the things we read this morning are good ideas. Agreed? Speak kindly, treat each other well. Think it through. Evaluate. 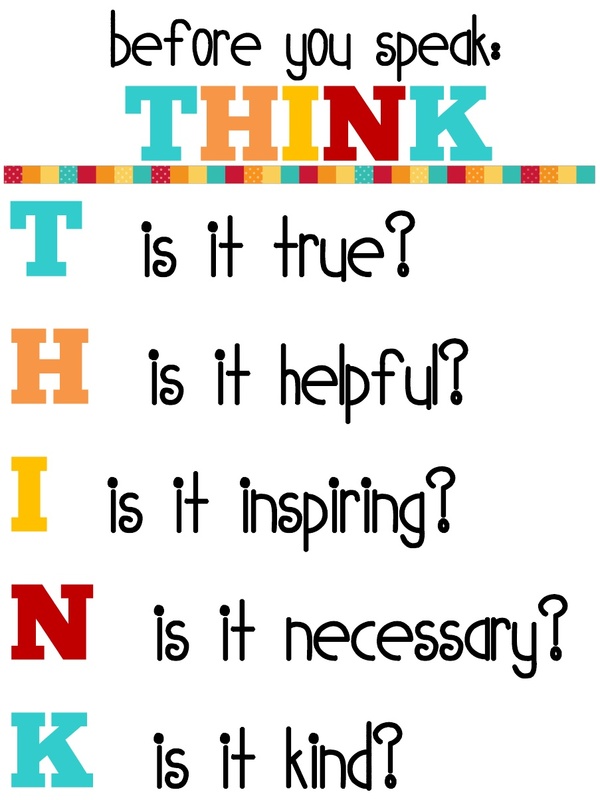 T.H.I.N.K. Walk through the gates, before you speak: is it true, is it necessary, is it kind? And if you can’t say something nice…Well, maybe not that one, not all the time. It’s not bad advice for a young cartoon bunny. But the reality of grown-up life, in families and in churches, is that sometimes we need to tell somebody something that isn’t all that nice, but needs to be said anyway, because it’s true and because it’s necessary. Then the key is to be kind. There are people who come to this naturally. I have the greatest respect for them. They are wired for respectful kindness and tenderhearted patience. They are saints, really. But most of us need to work at it. Kind communication is a tough spiritual discipline. It takes intention and practice. • We remind ourselves what is “Pilgrim Lodge-ical”…or not. • We put a list on the Sunday bulletin, or the classroom wall. • We write ourselves a note, or draw a picture of the three gates. • Or maybe we start with Thumper, picturing a bunny and quietly, kindly biting our tongues until we find the right words. Christians, it’s hard, but it’s not impossible. We aren’t out here doing it alone. We are loved by God, loved so much that God became one of us in Christ Jesus. I believe God is working for us and in us and through us, calling us to be beloved children and to live in love. Maybe that’s the intention we need, before we speak. Amen. I look forward to these each week! Thanks, Martha. So beautiful and true my friend. Thank you. Martha–Jayne directed me here. The sermon today at my church was on the same passage, and our guest pastor focused on the phrase “do not make room for the devil.” Somewhat of the same way of saying what you have so elegantly said. I’d love to HEAR you preach someday. Such a good way into this passage that is so hard to elaborate on. Thank you once again. Change the “little we”… brilliant way to say it. I have encountered another version with one additional gate — “If it’s none of the above, is it at least FUNNY?” but I’m not sure that wasn’t tongue-in-cheek! This is lovely. One of my “favorites” thus far! We are going to implement this in our house, ASAP!